Next on the “package show” hit parade is a look at “Fred and Barney Meet the Thing.” Debuting on NBC in September 1979, this package show consisted of 1979’s “The New Fred and Barney Show” plus “The Thing” of Marvel’s Fantastic Four fame. In December 1979, the show expanded to 90 minutes, folding in a half-hour show starring the Shmoo from the famed comic strip “Li’l Abner”; the whole thing was thus renamed “Fred and Barney Meet the Shmoo.” By any name, the package show was canceled in 1980, with the segments entering syndication as stand-alone shows. Note the Bedrock gang never interacted with Thing or Shmoo in the show itself—only in the opening credits and some bumpers. I’ll give my two cents on each individual segment below. “The New Fred and Barney Show” debuted in February 1979 (before folded into “Meets the Thing/Shmoo”) and aired for 17 episodes. While the modern Stone Age family have been long-time Saturday morning mainstays, this was the first new Flintstones series since the early 70’s “Flintstone Comedy Show.” It also marks the first full series with Henry Corden voicing Fred, taking over from the late Alan Reed. The show was meant to be a partial revival of the original series’ format; thus, Pebbles and Bamm-Bamm were preschoolers here. Even the theme song emphasized such (“it’s the same old gang you know…”). However, the show still changed things up, reflecting both the late 70s and being more aimed at children than the original series. A few episodes parodied then-current fads like CB radios or inflation concerns, while others featured our heroes meeting vampires and werewolves. The latter also happened in a Halloween special produced around this time. Per the norm, the obligatory “prehistoric” gadgets were updated for the late 70s—the Flintstones now had a microwave oven (a fire-breathing dragon in a box), along with the aforementioned CB radios. One episode sees Fred feeling that “modern conveniences” are making everyone soft, and insists on taking everyone camping to “rough it”; of course, things don’t go as planned. The 1980-81 TV season saw a new Flintstones series debut, “The Flintstone Comedy Show” (no relation to the early 70s incarnation). Hanna-Barbera did a Fantastic Four animated series in 1967; the team also appeared again in a 1978 series produced by DePatie-Freleng. However, while those two shows were fairly faithful (HERBIE the robot aside), the Thing’s own show took quite a few liberties. In this show, Ben Grimm was a skinny teenager who could turn into the Thing (who sounded like comedian Jimmy Durante) by slamming together two magic “Thing Rings” and saying “Thing Ring, do your thing!” He’d use his abilities to help his friends solve mysteries and take care of various threats/nuisances. The rest of the Fantastic Four don’t appear in this series at all. 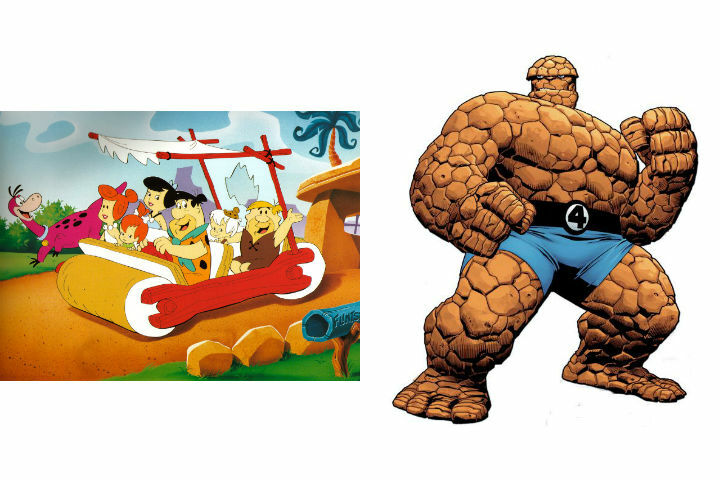 There were 26 11-minute segments produced; after the show’s cancellation, Ben Grimm wouldn’t be seen again in animation until a 1994 “Fantastic Four” series. This is definitely an odd spin-off—have to wonder why they bothered licensing the rights to the Thing at all given the big changes made. The comics themselves did eventually reference this show; a 2012 comic saw Darla Deering, an ex-girlfriend of Johnny Storm’s, fill in for a time with the then-missing Fantastic Four. Darla used the Thing Rings (and an exoskeleton) to gain the Thing’s powers. “The New Shmoo” was, like the Thing above, only loosely based on the comic from which it came. In Hanna-Barbera’s version, the Shmoo could shape-shift into various objects, but lacked the comic version’s other abilities. The Shmoo hung out with a group of teens, doing—what else?—helping them solve mysteries and fight crime. Al Capp fans likely weren’t pleased. After this show’s cancellation, the Shmoo appeared in 1980’s “The Flintstone Comedy Show,” as a part-time Bedrock police officer alongside Fred and Barney. None of the above stand-alone shows are available on DVD or digital video. On top of that, I’m not sure how the Thing would be handled; the Thing/the Fantastic Four are owned by Disney, who own Marvel Comics. However, Time Warner owns Hanna-Barbera, as well as Marvel’s long-time rival, DC Comics.